A photo of Sharyn is on the web page http://watvhistory.com/2009/06/progress-report-on-tv-research-and-visits-to-tv-veterans/ Vicki Halliday Shirley Halliday dancer Children’s Channel 7 was my life for many years, from dancing with Fat Cat and Humphrey, to being a dancer at many events such as Miss West Coast. …A lot of staff have experienced the Station when its Studios were at their production peak, and like myself are using the reunion for what it is – a rare occasion to catch up with many old friends & workmates of years gone by, and to celebrate the first 50 years of TVW7’s broadcasting history – not just attend an open day with studio tours and a few drinks after. 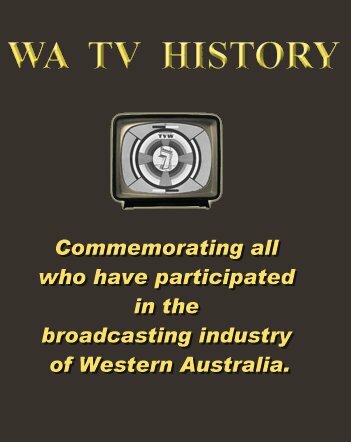 A lot is happening behind the scenes in the lead up to TVW’s 50th Anniversary Show, which is being researched by Sadie Purser, and the TVW Reunion scheduled for Sunday October 16th, in the grounds of Channel Seven, which is being organised by a committee comprising Bret and Jocelyn Treasure, Keith Bales, Keith Mackenzie and Johnny Young, with TVW representatives Jill Glass and Sadie Purser.